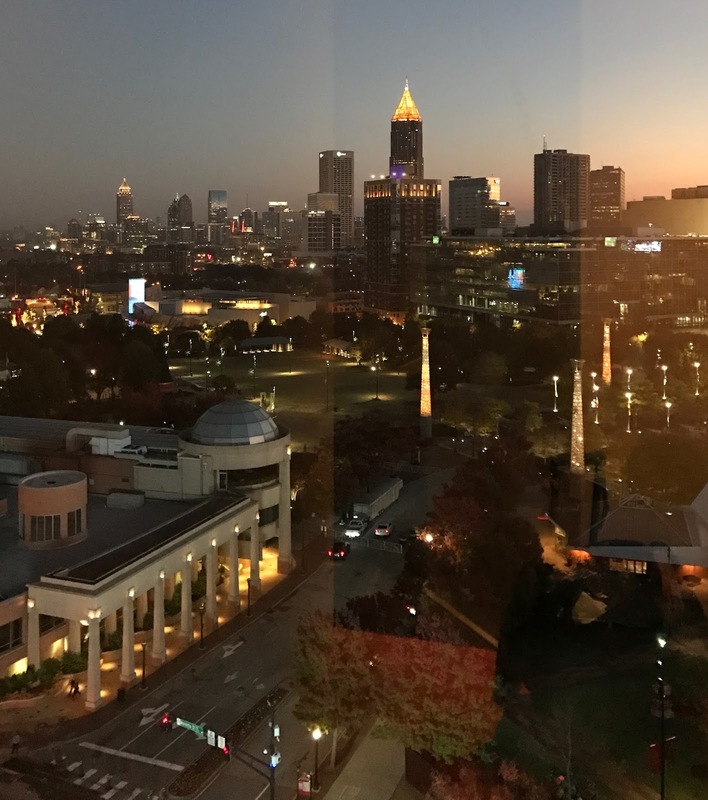 The weekend before Thanksgiving 7000 educators traveled to Atlanta not to break bread but to be nourished at the table of learning. I was one of them. What awaited for us was a neon-colored surprise. 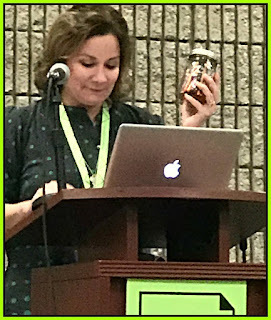 NCTE celebrated a rebranding of its logo and a technicolor explosion of voices advocating for enhanced learning experiences. 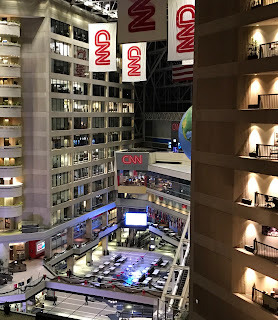 Arrival to Atlanta was smooth and check-in not a problem until my colleague, Michele Haiken, and I entered our room to be faced with a strong odor, a not so appealing mix of deodorizer pumping in from the vent. We called the front desk and had the hotel come up with options while we went back to the convention center for the Secondary Get Together with my friend, Kwame Alexander. 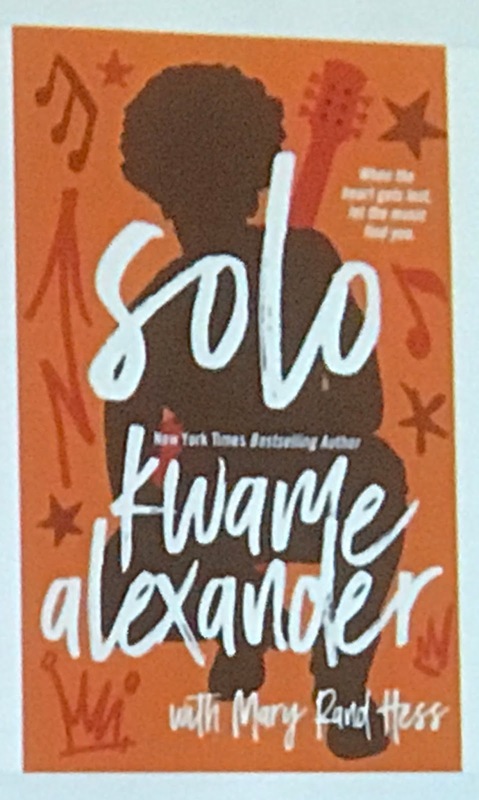 Between the power of Kwame's presence, the news of his first YA book to be released, and the Mac and Cheese fest, I almost forgot the hotel incident. 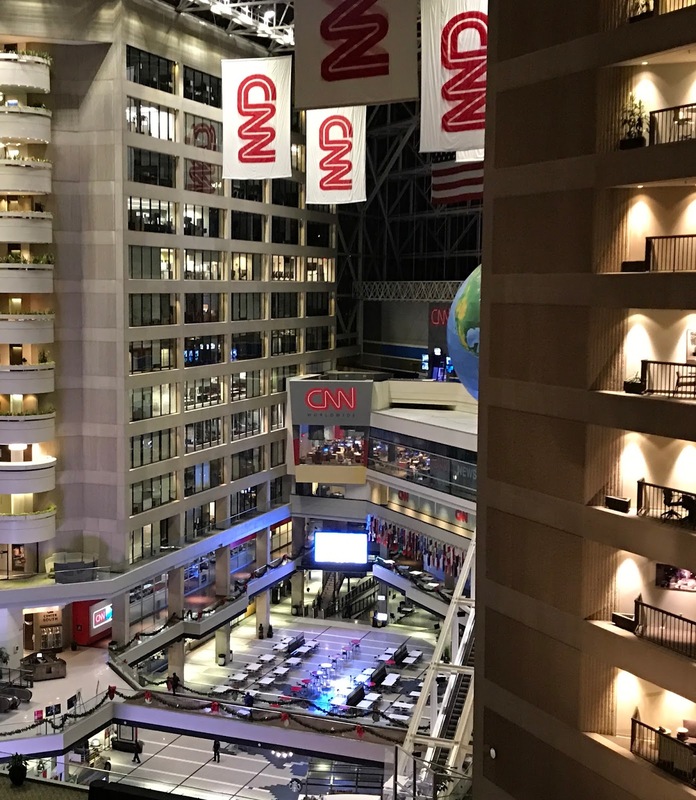 Staying positive, we returned to the hotel and our patience was rewarded with a new room that overlooked the CNN Center. When I closely notice what is around me, learning never ceases to amaze me. From the arrival in Atlanta to registration at the Georgia Congress Convention Center, to a magnificent sunset at the end of the day, my noticings led to wonder, new learnings, and the realization that the table of learning is a marvelous space for all in the field of literacy to be nourished. 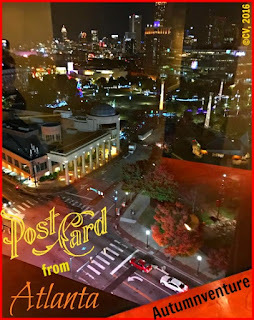 While in Atlanta, I met many slicers I write alongside weekly. 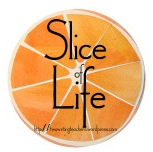 Please visit Two Writing Teachers where Slice of Life Tuesday has been populated with many savory posts. For several weeks I have been eagerly awaiting the 2016 National Council of Teachers of English Convention. Now today, the day after my return from Atlanta, I reflect upon the memories of NCTE 16. Upon arrival, I sensed a celebratory spirit floating through the Georgia World Congress Center. Excited crowds of educators gathered for a visual feast of a bold rebranding, literary luminaries, book-filled halls, student musical ensembles, and lots of southern charm. Smiles were plentiful as people greeted each other in hallways or waved on the many ascending or descending escalators. Within the fast-paced motion of comings and goings, seven thousand educators moved joyously from one experience to another. In between hurried steps, I often paused for short conversations that extended learning from inside conference rooms to outer halls. There were also meet-ups originating from virtual relationships developed on Twitter. 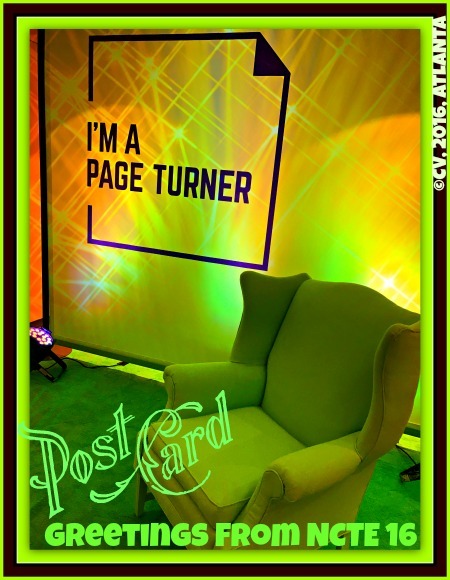 inspired by the novel NCTE mantra, "I'm a page turner! 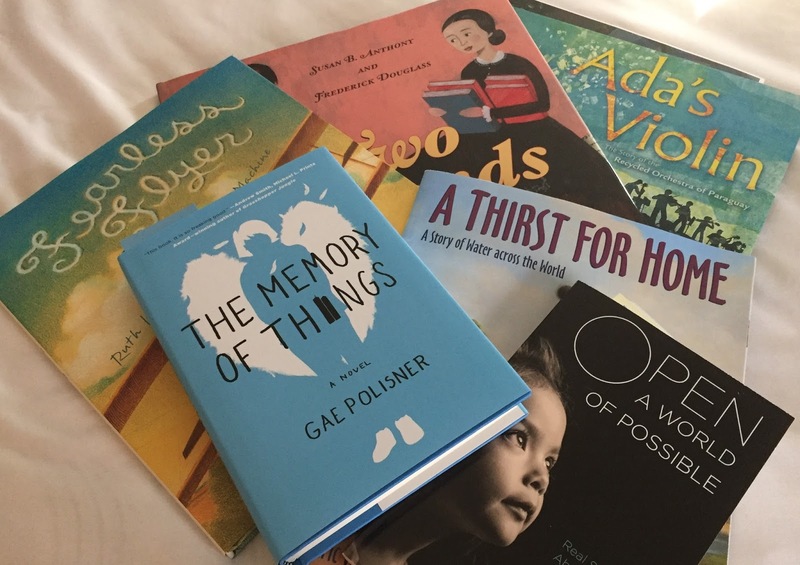 ", many voices rose in a collective chorus-advocating for page-turning opportunities to build or enhance student-centered classrooms of wonder and joyful learning. 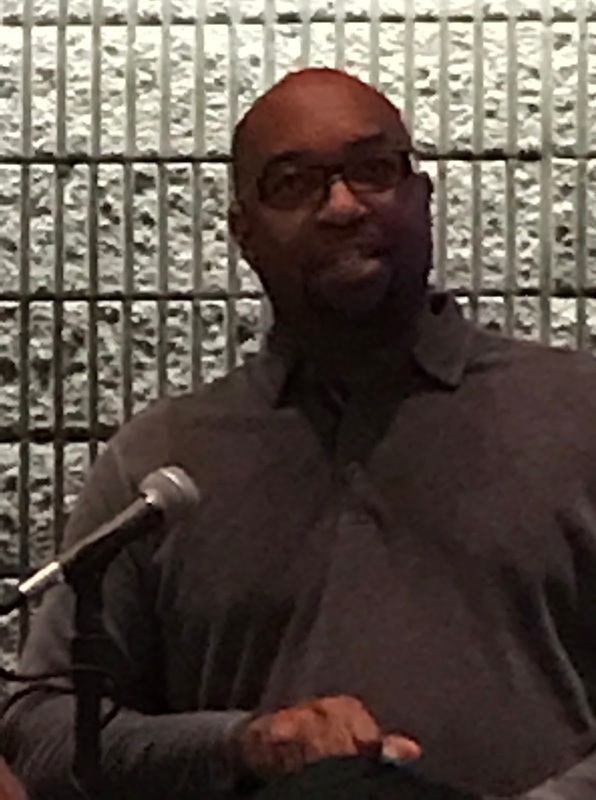 NCTE 16 was joyous learning event with committed colleagues who shared a similar vision of a better educational future for all students. From the spectacular opening General Assembly to the last session I attended, magic happened at NCTE 16. Today, a bit tired from the energized convention pace, I return to life as I know it but remember that each day opens as a new page. 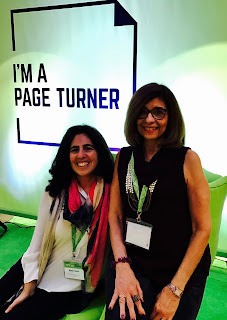 I join Ruth Ayres, who was at the convention with me, in celebrating this week at her blog, Ruth Ayres Writes-Discover, Play, Build. 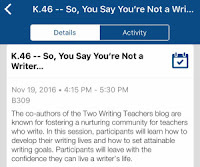 "Engage Learners with Compassion and Empathy"
While I am at #NCTE16 a class of "Kinders" (Kindergarten students) are steeped in the act of noticing, wondering, and writing poetry. 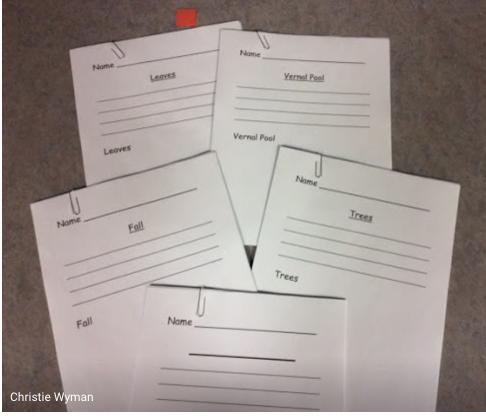 Ms. Wyman's Wonders are first time Kindergarten nature poets who are writing about autumn for my Autumnventure Gallery. 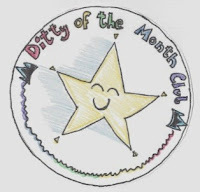 When I received the collage below, I was so pleased to that I set off to create an award for the little learners who are engaged, proud writers. Isn't it wonderful that our youngest learners are learning how to express themselves? The list poem format seems to work well for these little ones. 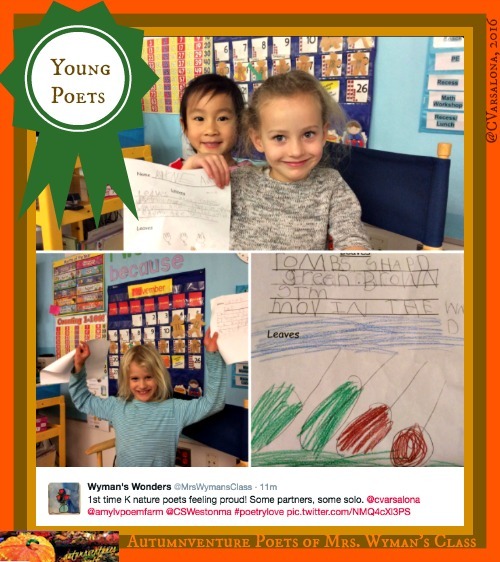 These kinders are feeling #poetrylove! You can see their back story and photo journey here. I am looking forward to their class poem. 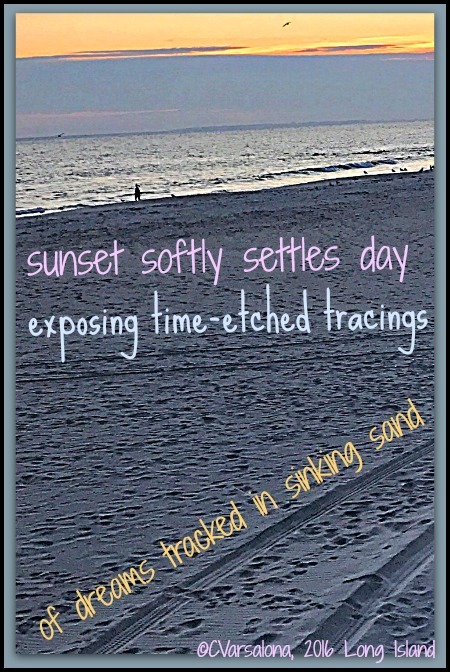 Maybe, I will even have a few individual poems to showcase at the Autumnventure Gallery. 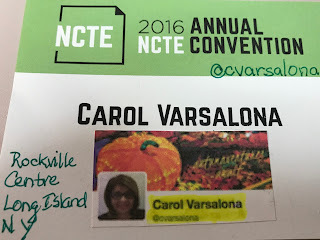 Signing out from the NCTE 16 Convention. 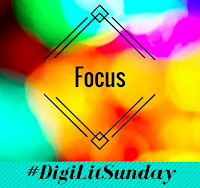 Take a stroll over to Brenda Davis Harsham, my writing friend's blog, Friendly Fairy Tales for the Poetry Friday Round-up. #NCTE16 Convention fever is spreading as many of us across the country are anticipating the flight to Atlanta on Thursday. Last minute conversations via Twitter, email, and GHO are happening. Badges are arriving and materials for presentations are being loaded into Google Drive and computers. Needless to say, I am excited. 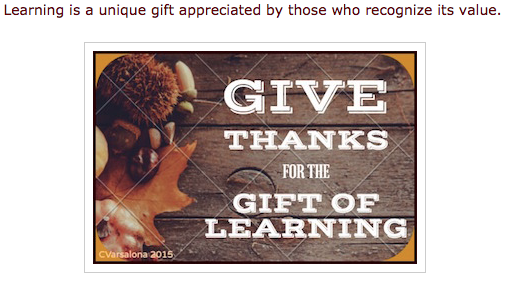 Since I am moderating #NYEDChat on Twitter tonight and we are speaking about "Thankfulness", I am recycling my gratitude-for-conference learning digital. My badge finally arrived at 4:30 pm today. My husband hand-delivered my mailer from NCTE since he knew I was eagerly anticipating its arrival. I quickly included my Twitter handle since I missed the directions to have it listed on the badge. Then, I printed my Twitter profile photo and included it along with my Long Island hometown on the badge. As I check off my countdown-to-conference list, I am reminded of John Denver's song, Leaving on a Jet Plane. While my bags are not packed and there are still many tasks to accomplish before Thursday, I am ready to learn alongside others, meet up with colleagues, present with my teams, and enjoy four days of educational bliss. 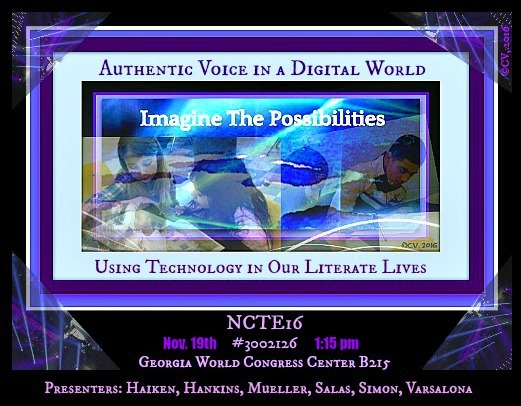 I.27 1:15 pm 11/20/16 Authentic Voice in a Digital World: Using Technology in Our Literate Lives B215 How can teachers be digital change agents, transforming reading and writing lives in K– college classrooms? Join a panel of authors and educators from varied backgrounds (Michele Haiken, Paul W. Hankins, Holly Mueller, Laura Purdie Salas, Margaret Simon, Carol Varsalona) to explore technology innovation in student-centered learning spaces where choice leads to increased voice. 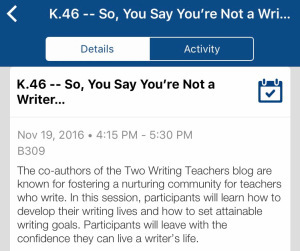 I look forward to meeting my Slicer friends at #NCTE16 but unfortunately cannot attend their presentation since it is the same time as the K.14 that I am involved in as a Wonder Lead Ambassador. 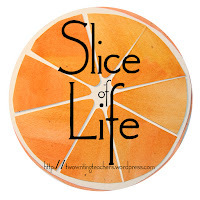 Tomorrow is Slice of Life Tuesday at Two Writing Teachers, so join me in reading other slicers posts here. do we take a step back and ponder this? During struggles, life takes a turn and we often lose sight of the road that frames our journey. We become enmeshed in a dark web, trying to break through threads to find our way out. We lose sight of the positives and simply forget to step back to see the colors of life coming through the tangled mess. Now, as Thanksgiving approaches, is the right time to pause, reflect, and be grateful for the struggles of life. Now is the time to put a positive spin on the struggles and note them as being productive ones. Now is the time to join families and friends, to come together, untethered by life's messy happenings. What if we sit at a table of thanksgiving not to reiterate the struggles, but celebrate unity, connectedness, joy, and positivity to clearly see the colors? In education, we call the tangled mess, the productive struggle. We help students understand that struggle is a step on the road to discovery. 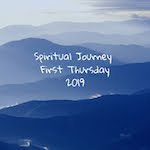 We support them in the journey by offering resources to help them become resilient to negativity and ardent about transversing the road onward. We discuss the detours, we guide their path, and we put on rose-colored glasses to brighten the roads ahead. 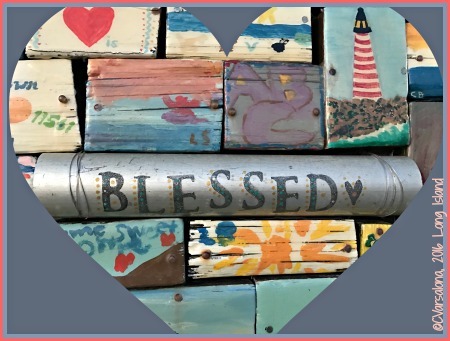 As we approach Thanksgiving, I celebrate the idea of coloring my world with gratitude, putting aside difficulties and disappointments, so the path can be filled with clarity and hope. I celebrate a thankful, positive spirit that will guide the journey ahead. 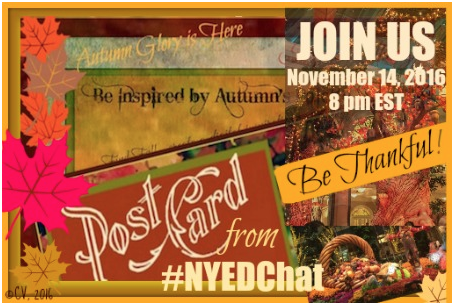 To continue this theme, please take a few moments of your time to join my #NYEDChat co-moderators and me on Twitter this Monday night for an educational chat. 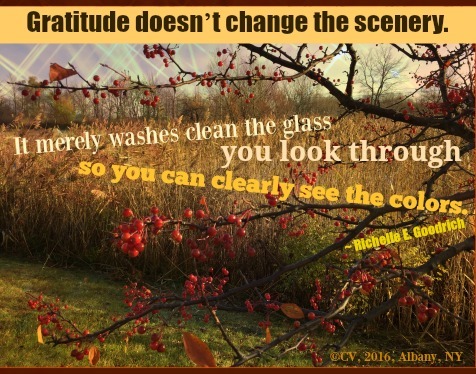 The topic is thankfulness and we will center our thoughts on coloring our world with gratitude. 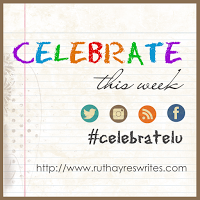 Please visit Ruth Ayres and the Celebrate This Week community here to read how they celebrate the positives of their week. Being part of a community of writers who color their world with gratitude each week is a blessing. There is a certain calm in the November air as I gaze into an autumn field. The chill does not dissuade me. I stay transfixed on the peacefulness of the scene, pick up my camera lens, and freeze the quiet beauty of morning. I capture its essence thinking that winter is waiting to make its entrance. For the time being, I linger to notice the last colors of autumn and wonder how this feeling of serenity will affect my day. Then, I turn to join my colleagues for a day of learning. The digitized image below is a combination of apps smashed to capture the serene morning scene. I showcase Emily Bronte's poem for its lines that resonate with me: Every leaf speaks bliss to me/Fluttering from the autumn tree. 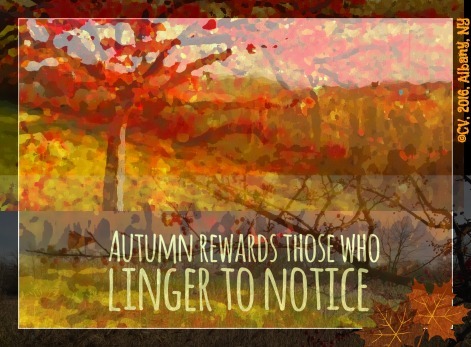 Linger awhile in Autumn. Then, turn to Jama's Alphabet Soup, the wonderful blog site of Jama Rattigan, poetry advocate, blogger, and food connoisseur where you will find the Poetry Friday Roundup. 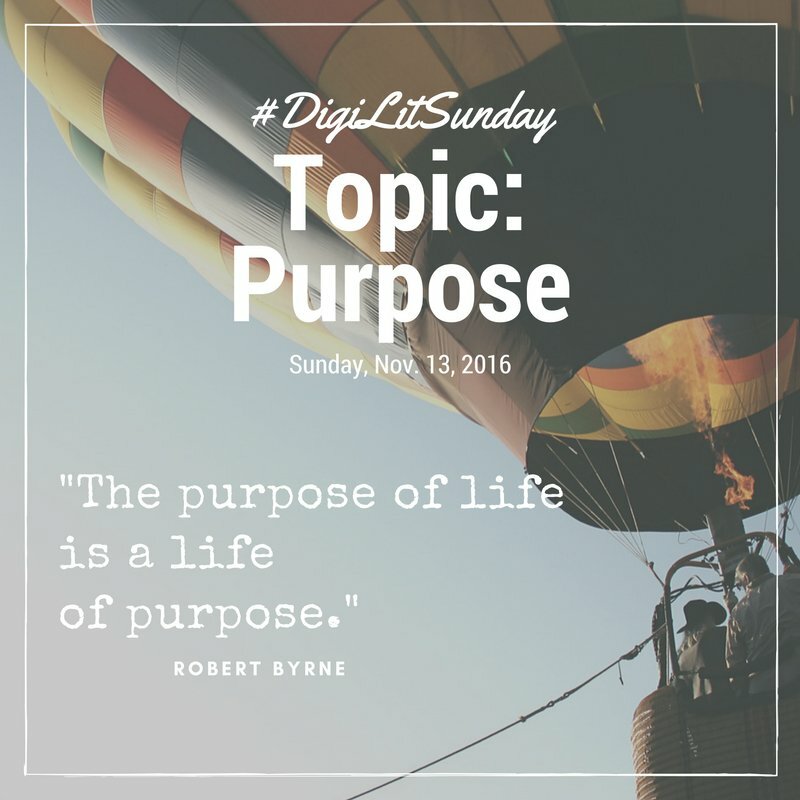 Continue the path of wonder with Margaret Simon and the DigitLit Sunday community this week as they discuss the topic, purpose. Being inspired to capture fall this season has led me on a purposeful digital journey. You can access a new digital composition I created, a revolving Rubik's cube of three autumn scenes, here. 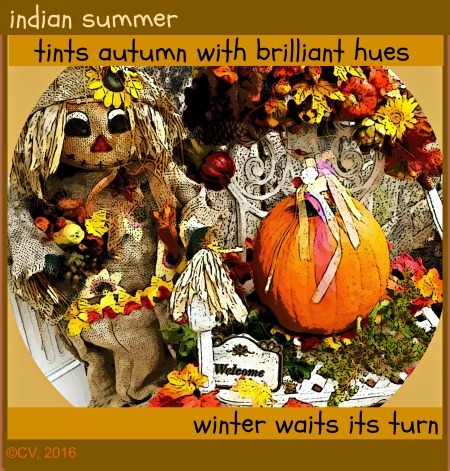 I am accepting diglitacompositions, inspirational quotes, image poems for Autumnventure. Please submit your offerings this coming week. 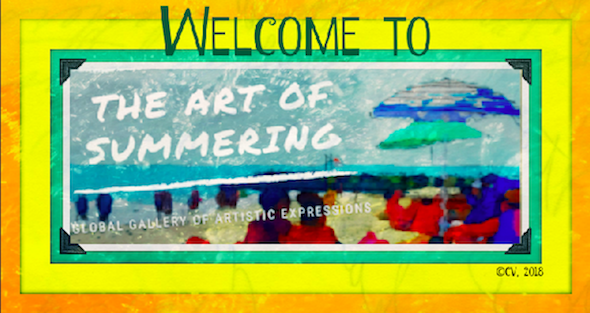 Be one of the creative voices of my newest global gallery of artistic expressions. 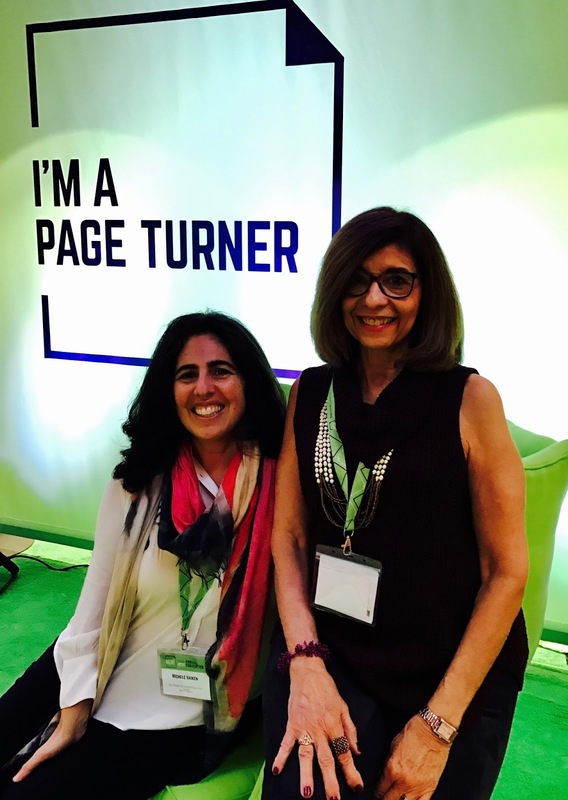 How fabulous to enter an auditorium and hear the chatter, see the active networking, and listen in on conversations about books! That is what I found when I arrived at #nErDCampLI on Saturday, November 5, 2016. 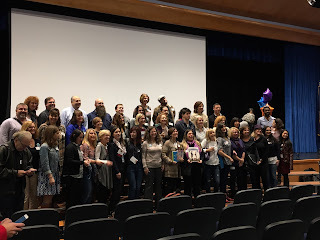 350 educators joined the unconference at Jericho Middle School on Long Island to be inspired by a long line-up of authors and colleague presenters. 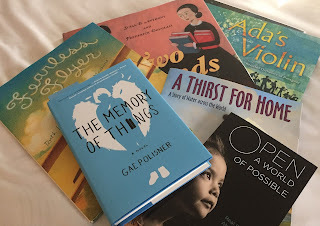 #booklove was in the air. The day started with a huge cheer by JoEllen McCarthy to get the learning rolling. Tweets were sent out and photos taken. Educators traveled from Maine, New Jersey, and upstate New York to Long Island to be wowed by well-designed book fest learning experience, EdCamp style. Conversations with authors were common. Educators waited patiently for books and signings. Everyone walked away happy for there is something special about being a book nerd. Many thanks were extended to JoEllen McCarthy, her nErDCampLI team, and the authors. Being a book nerd is a lifelong calling! 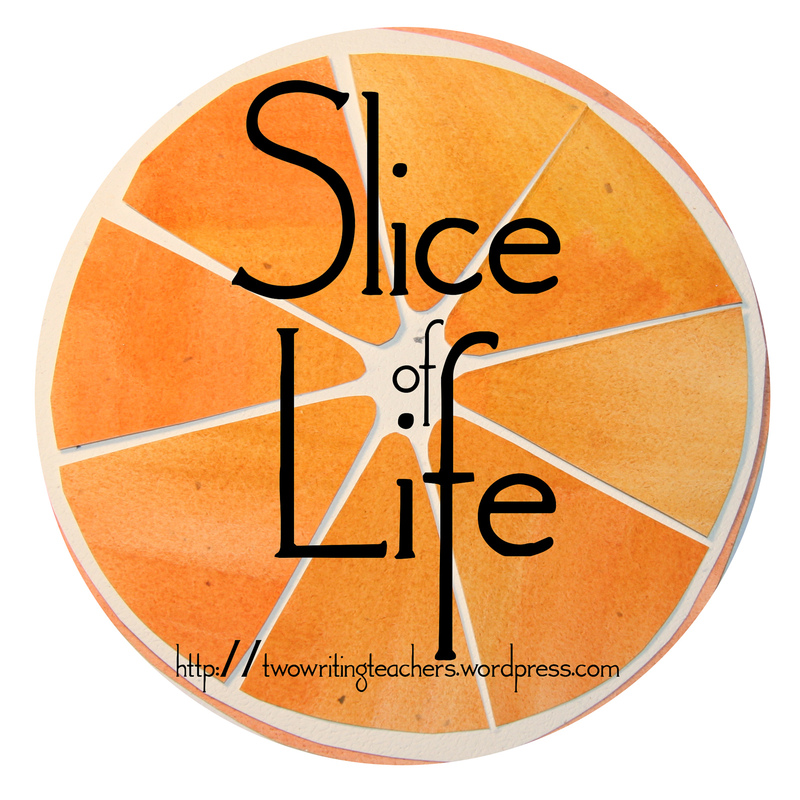 Join the Two Writing Teachers for Slice of Life Tuesday here to read what other slicers are writing about. Teachers are difference makers who impact learning on a daily basis. 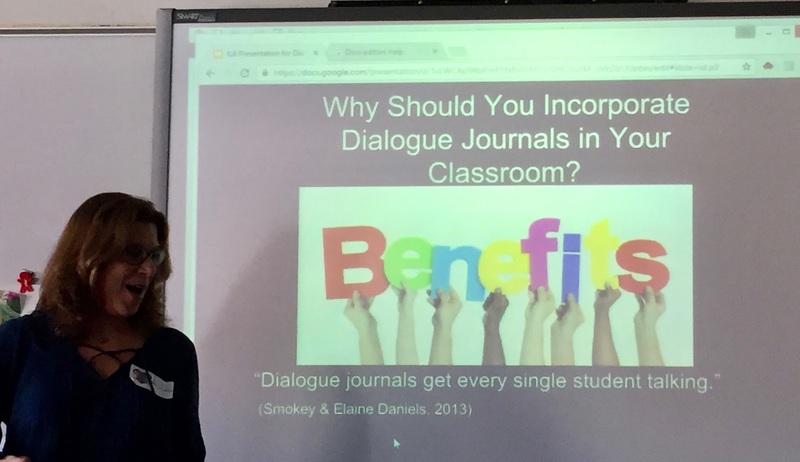 This week, I was fortunate to work and collaborate with a varied number of passionate educators. 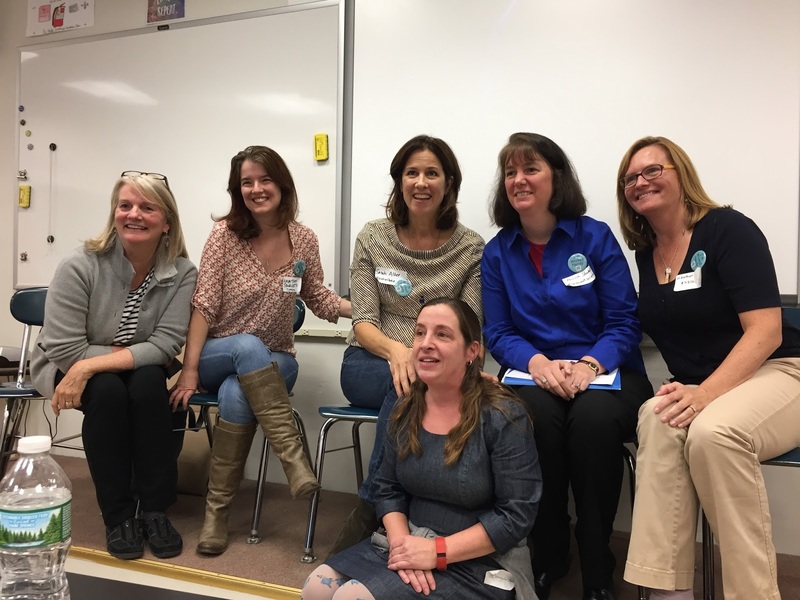 The energy level of the professionals made focusing on best practices to power up student-centered literacy a joyful experience. It all started on Sunday when I called in my NCTE 16 Roundtable team to a GHO. 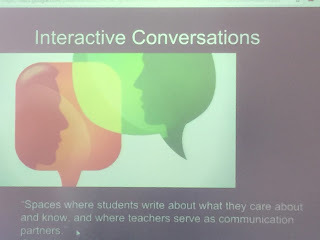 While the technology was a bit spotty on my end, we engaged in a lively conversation in real time. 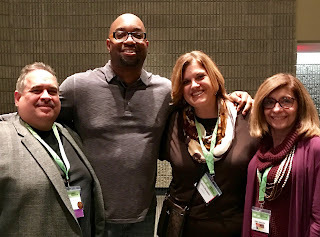 Needless to say, the team (see below) is excited to deliver a passionate presentation to teachers who will join our roundtable discussions in Atlanta, Georgia in a few weeks. The next day, Halloween, was filled with educational treats, not tricks. 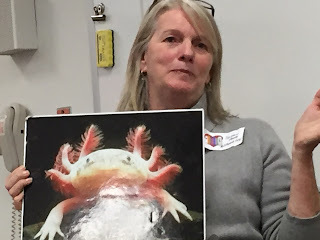 I facilitated a full day of professional development for a group of teachers who created passion-filled, engaging inquiry-based lessons leading students to become "reading fit" for life. The following images were tweeted during the session to showcase the passion of educators on #CelebrateMonday. 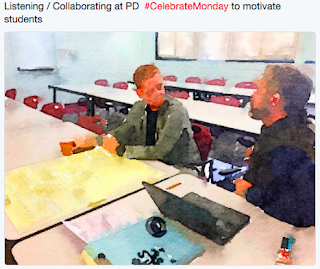 Using the hashtag, #Trendthepositive on #CelebrateMonday is a way to publicize teacher expertise, enthusiasm, and engagement. Halloween night was filled with candy and tweeting treats. 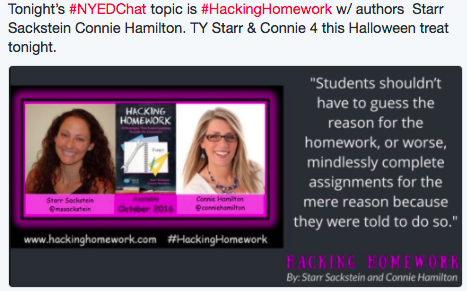 I moderated #NYEDChat that included engaged educators participating in a lively conversation with Starr Sackstein and Connie Hamilton, authors of Hacking Homework. The transcript of the convo can be accessed here. 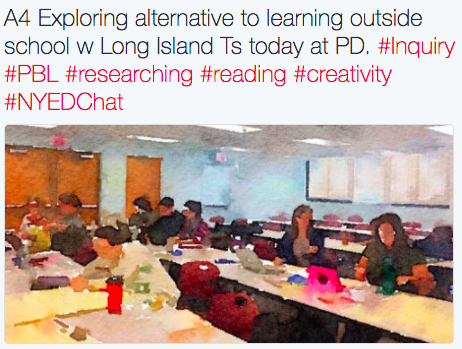 I followed up these experiences with two more professional development sessions. Each group of teachers was a joy to work with. 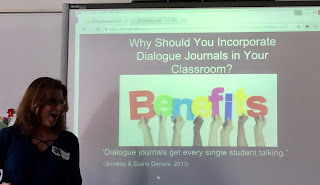 They dug right into ways to energize their literacy practices while promoting student voice through choice options. Teachers engaged in a Chalk Talk experience, silent conversation on paper to be able to offer a similar experience to their students. 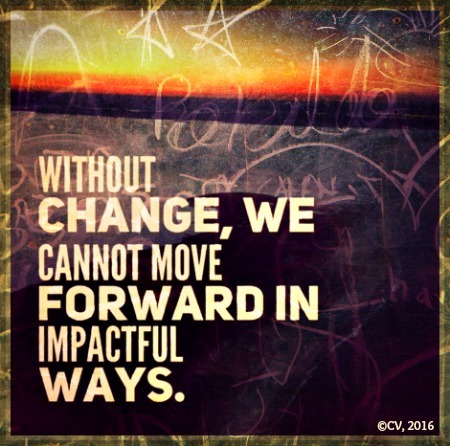 In order to impact teaching and learning, focus is needed. Educators who are difference makers make it a practice to focus in on ways to ignite wonder and inspire students on inquiry paths. I celebrate their passion, energy, and perseverance while focusing in on collaborative protocols to foster change. 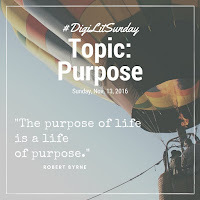 This post is dedicated to two enthusiastic and impassioned groups of educator blogging communities. 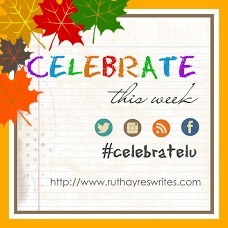 Please join Ruth Ayres' Celebrate This Week to hear from Ruth and the community on a week of positive celebrations. 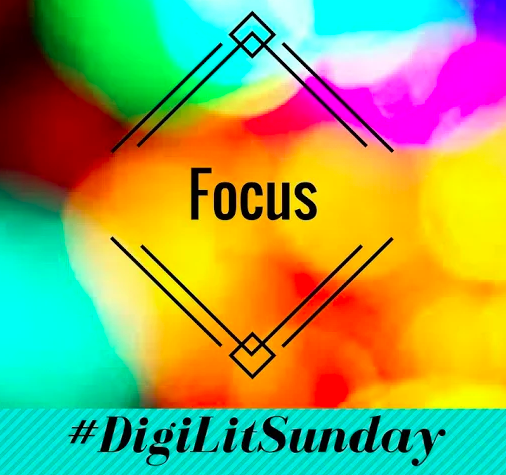 I am also joining Margaret Simon at DigiLit Sunday where the topic this week is focus. Focusing on impacting teaching and learning by honing craft and amplifying voice is an important mission for me. from Indian red to maize. in spots, not the full Crayola range of reds, browns, oranges, and yellows but enough to enjoy the transition. Time to consider sending in digital inspirations: imagepoems, inspirational quotes, photographs of autumn for my upcoming Autumnventure Gallery. Collecting offerings now! 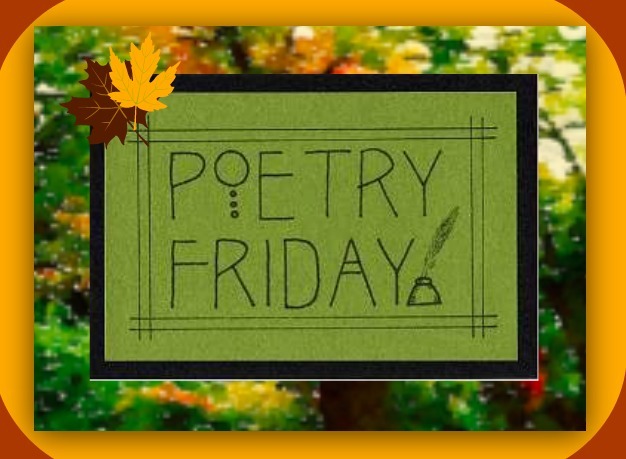 Join my poet friend and colleague, Laura Purdie Salas, for the Poetry Friday Round-Up at Writing the World for Kids. She and the Poetry Princesses have terza rimas for us to read.